It's not easy to find an instructor to teach a PPL student in something as incongruous as a Searey, but I did. 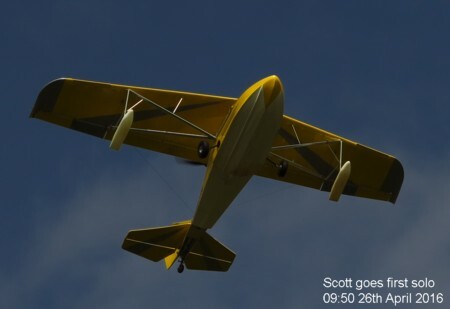 Scott went solo in his aeroplane, and only did one circuit as the toggle switch for the flaps broke when he retracted them. 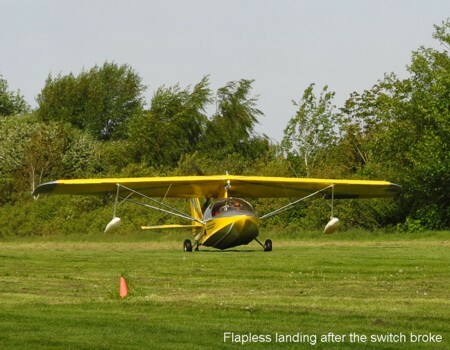 This meant doing a flapless landing,which he did very well. The next day he found a crack in the exhaust and so this meant no more flying before I left for Asia. I did take him for a ride in the Chipmunk on Wednesday as this aeroplane needed to be flown. I'm pleased to report that Matt passed his PPL flight test in the Cessna 150 last weekend. This was a relief as he had a couple of previous attempts cancelled, and I have not been able to do as much recurrency training as I like before the test. 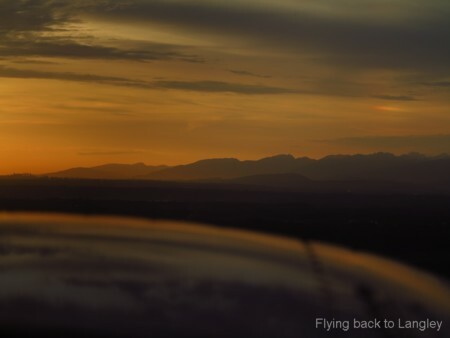 I did manage an early evening flight on Tuesday 26th. 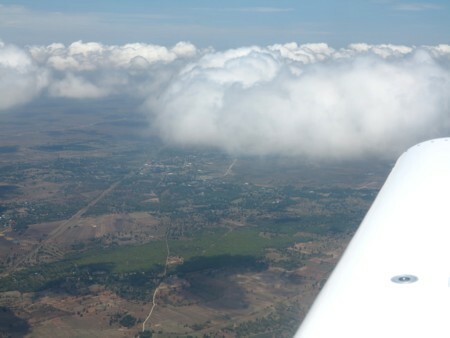 On Wednesday I flew with James in the Cessna 150 that has had a noselegectomy and now sits on its tail. Circuits at Abbotsford, and he was getting close to solo standard. 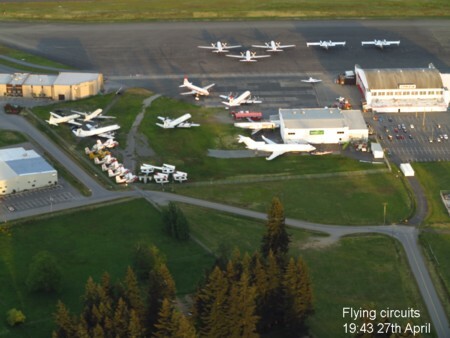 Thursday I packed my bags, took the car to Boundary Bay, and left it in the hangar. 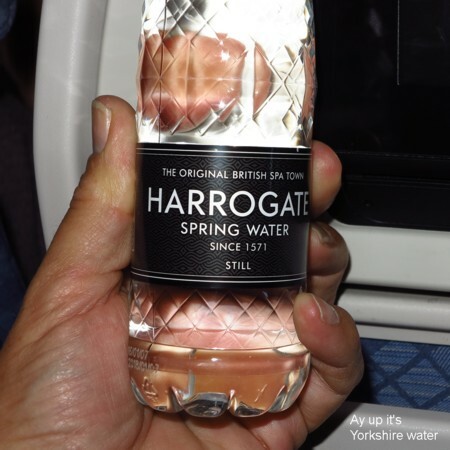 Perhaps Cathay is in collaboration with Yorkshire Airlines? In the morning I had a good walk around the locality and onto the old Kai Tak Airport ground... Not much to see as the place is a hive of construction activity. I note a major MTR development with an underground railway. After checking out of the hotel I walked to the next main street and got on a bus to the Star Ferry terminal... I have an Octopus Card which is a do everything card, public transport through shopping, just load it with some money and away you go, just like a native. I wended my way to the MTR and took the underground train, changed once, and then caught an airport express train. It's easy to get around Hong Kong/Kowloon, just like London. 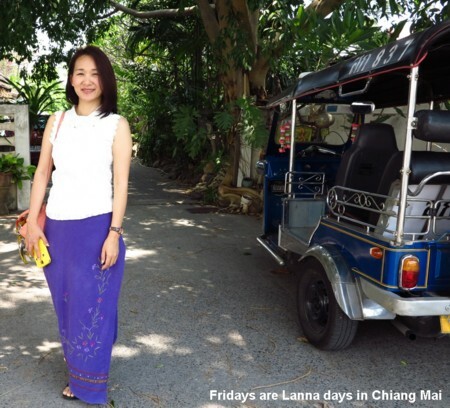 [Cathay Dragon] was on time into Chiang Mai Airport, I was surprised that Immigration was quiet and so I was through in no time. I picked up my checked bags, passed one through the Customs X Ray, and was out into the terminal in quick time. 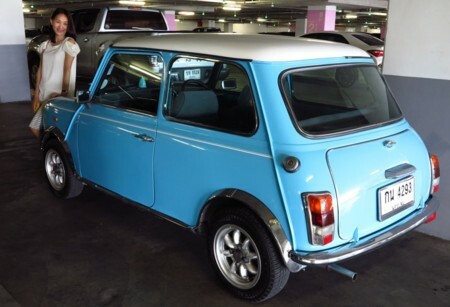 I took a taxi to Kois' house, picked up the Ford Aspire, and drove to Nine's Kitchen for a bite before heading home to Pada mansion. On Friday night I took a taxi from Kowloon station to the Bridal Tea House Hotel which is next to the old Kai Tak Airport and opposite the Hong Kong Aviation Club. The taxi almost took me there, the driver let me off a block away... He didn't know where he was going, but fortunately I'd taken a screen shot of the Google map of the area. And so I easily made it under my own navigation. 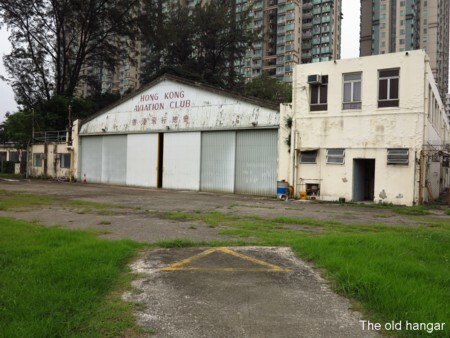 I visited the Hong Kong Aviation Club and was shown around by Kit. 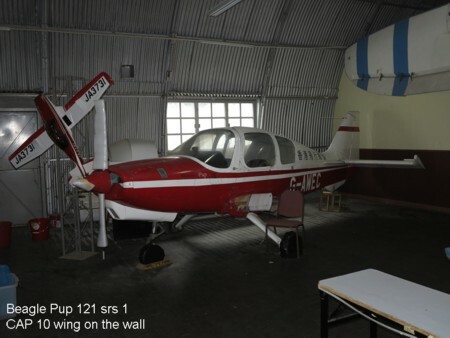 It still has the instructor offices and ground briefing facilities while there is flying available to at high costs, I photographed the rate sheet... 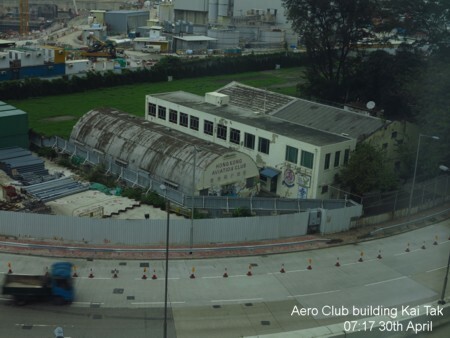 I noted they have a Zlin for aerobatic hire at HK$2,850 per hour. On my way back to the hotel I met a Hong Kong Air Cadet... We've had cadets from here come to Canada for training in the Diamonds. I turned around and was shown their office next to the hangar... In the Nissen Hut there's the wing off a CAP10, and an complete Beagle Pup 100 with its wings removed. 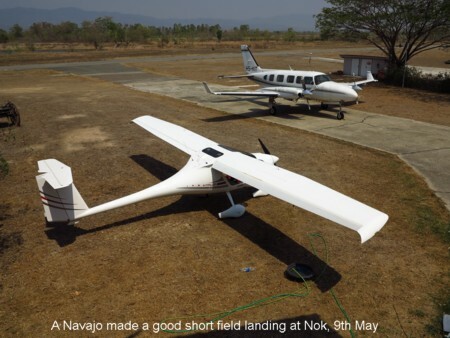 On Friday NaRuk waited patiently at the airfield while we worked on the RV9A. 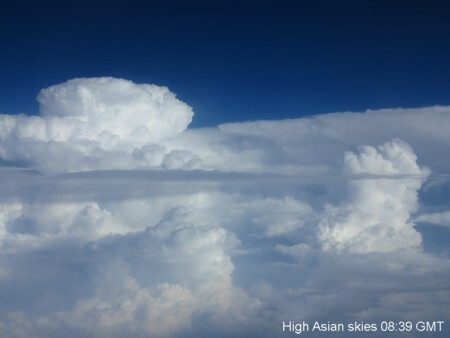 All was well so Daren and I went for a 35 minute flight to check all systems were operating normally. 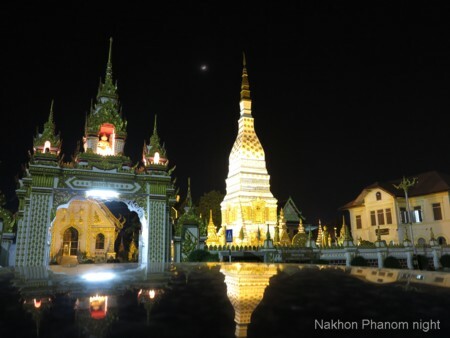 NaRuk returned to Bangkok on Sunday evening and so it was back to the proper purpose for my trip here to Thailand. Monday afternoon we took the RV9A for another local flight tocheck for snags. This time I had a flash through my mind and so I requested a practice ILS if ATC could fit it in... "Hotel Sierra Mike Alfa India turn right 150,climb to 3,500 feet, vectors for the ILS"
It was fun, and Airbus was told to reduce to minimum approach speed, so I maintained 110 KIAS for the whole approach, went around and was told to turn to 090 on departure. Tower told me to contact Approach once again and the controller started to vector me around for another ILS... I asked for direct to Doi Saket as one ILS approach was enough to show that the Garmin 430 and the Advanced glass cockpit were performing correctly. My first week back was spent helping out with the modifications and rework on the RV9A to correct the snags. The wiring harness supplied by Aircraft Spruce had to be completely replaced, and now all the avionics seem to function correctly. Aircraft Spruce did replace the Garmin 430 under warranty, and this functions well. The temperature varied between a cool +39 degrees and a hot 42 degrees... You lose a lot of body fluids especially inside the cockpit and in around the rudder pedals! NaRuk arrived on Thursday evening to brighten my days even more. I can't stop smiling. We had a dinner appointment on Saturday evening at the Shangri-La Hotel, so we went dress shopping... I introduced NaRuk to the red dress... I always think black is a cop-out! She looked stunning in red. We also met up with Pakorn and Lek who flew with me in the DA40 to Squamish and back last month, and Khun Bee and her family. 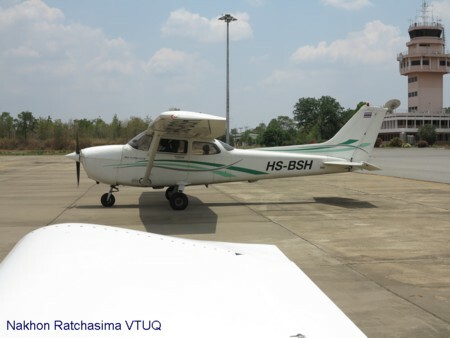 Khun Bee used to work for Chiang Mai Flying Club. 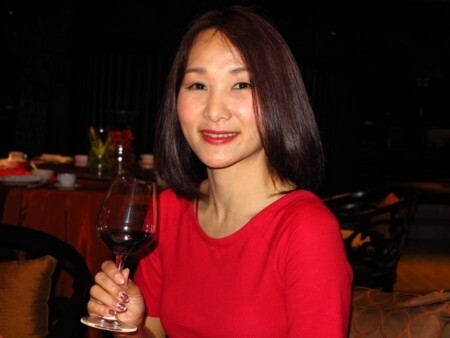 We recently lost our friend Aor to lung cancer. (We met at Aor's wedding last year). 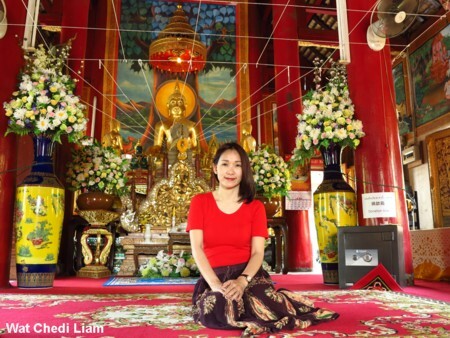 So we went to the temple (Wat) to have a monk say a prayer for Aor. After my previous experiences I had prepared Estimated Enroute Times for places along the route as ATC always ask for them. I added these to our departure time 14:29. We climbed to 5,500 feet while intercepting the 133 degree radial outbound from CMA... ATC like to know what radial you will fly on, and they will correct you if they think you're wrong. I flightplanned to depart at 05:30 zulu... Yes that's UTC! 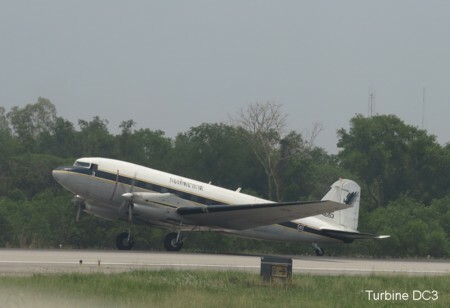 Engine started at 12:21, but held short on Bravo for an Airbus to land and then a DC3. As with last time I asked for an intersection departure to avoid the arrestor cables across the runway. 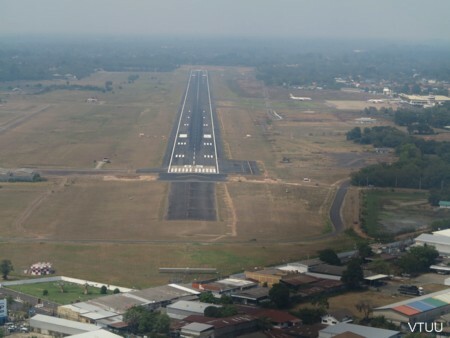 The flight time to Khon Kaen was precisely thirty minutes and so the total flying time so far was 2 hours 27 minutes. 79 litres of 100LL was added = 32 litres an hour or just over 8 gph (US). I like to lean, but the RV9A's cylinder heads run precariously hot, this was a problem in the previous RV9A I flew as well. As the engine runs in I have managed to reduce the fuel consumption. 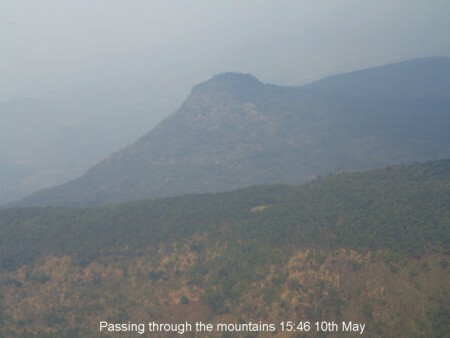 Climbing at 90 to 100 KIAS with richer than ideal mixture settings also helps. 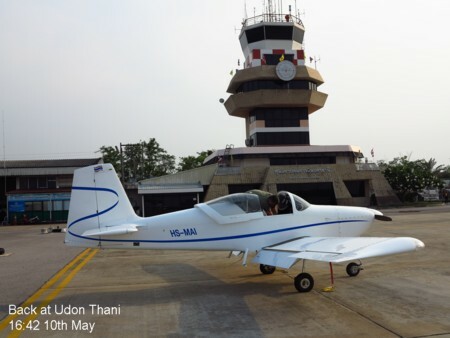 We arrived at Khon Kaen to see two of Thailand's flying schools in attendance. Isaan is a good place to be training with good weather most of the time. I went to the terminal to pay the 85 Baht landing fee, and then I filed a second flight plan with the same cheerful lady I spoke to earlier. Now it was time to test the RV9A in the purpose for which it was built: Cross Country Flying. 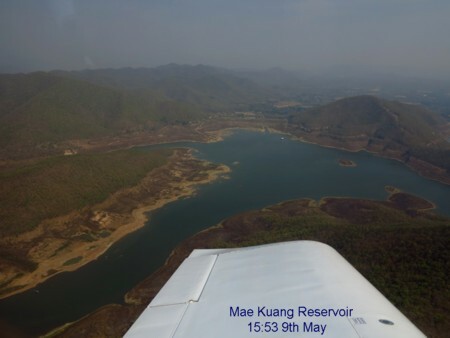 All flights in Thailand require a flight plan and so I phoned Chiang Mai Flight Planning to do this... Tried several numbers, but could not get through... What to do? The chap who answered the phoned remembered me from last time; not a bad thing. He took my flight plan. 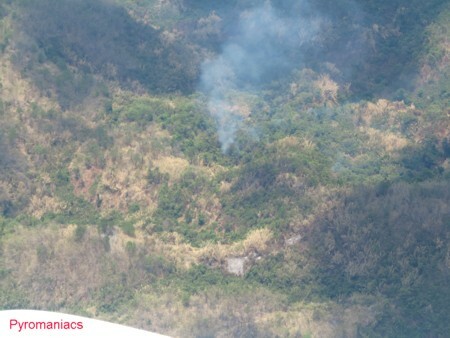 A couple of phone calls later and Chiang Mai Aprroach had received my flight plan and we were cleared to start from Nok. Arrival at Udon was delayed as we were told to slow down for a Boeing 739 on 30 mile final... We orbited a bit on the downwind leg and then followed the 737 in, above its approach path, and a respectable time behind. 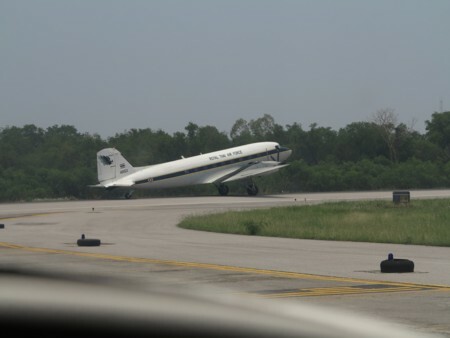 Landing was at 16:26 after 1 hour 57 minutes in the air. We stayed at the Centara Grand Hotel in Udon Thani, ate at the local farang restaurant, and then played pool into the evening. 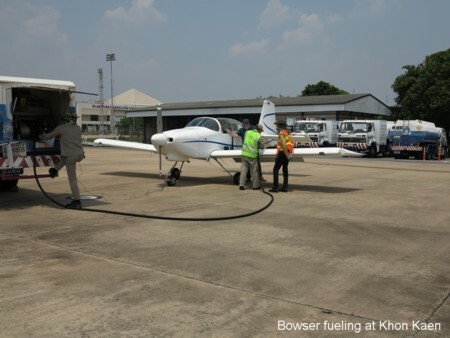 In the morning I tried to file a flight plan from Udon to Khon Kaen for a fuel stop, then on to Nakhon Phanom but this proved to be too complicated. 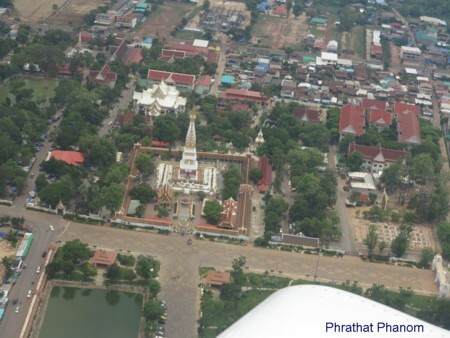 I opted to file a flight plan to Khon Kaen, and then file another one from Khon Kaen to Nakhon Phanom while the aeroplane was refueled. 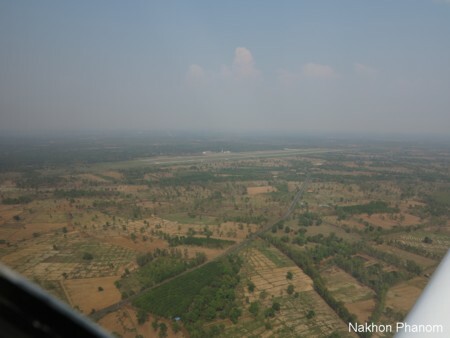 The flight to Nakhon Phanom took 59 minutes. I asked about taxying to the flight college, but the controller insisted we park in front of the tower. We tied down and went to the terminal where I paid the landing and parking fees, and filled in the Airport Log. 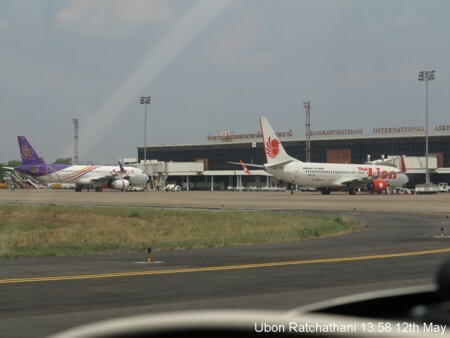 Departure from Khon Kaen was delayed due to an Airbus 320 that started after us being given priority. Sitting there ready to go from the taxyway intersection I asked if I might leave while the Airbus was still back tracking but this was refused. After the Airbus left I was told to line up, and then cleared for takeoff... I told ATC I needed another minute or so separation from the heavier aircraft... The controller then was concerned as another airliner was on final. But letting us go before the Airbus would have been no trouble. Clearing us after an Airbus departs means that time should be allowed for wake turbulence. 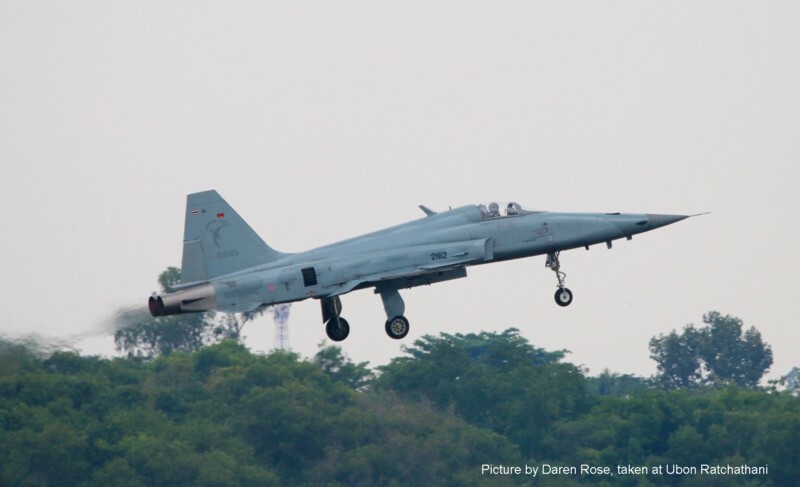 We were off without affecting the aircraft on approach. On arrival at the hotel I was confused by my watch, I showed 18:00, then 19:00, and the second hand was spinning. I have had this Swatch for many years,and finally the sweat and the heat seems to have done it in, it was spinning out of control. 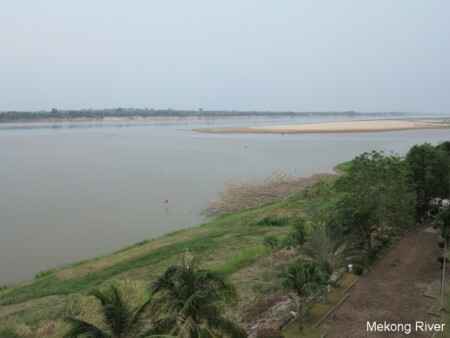 My room in the Fortune River View Hotel looked straight across the Mekong River to Laos. I took a walk in the evening along the river and back. 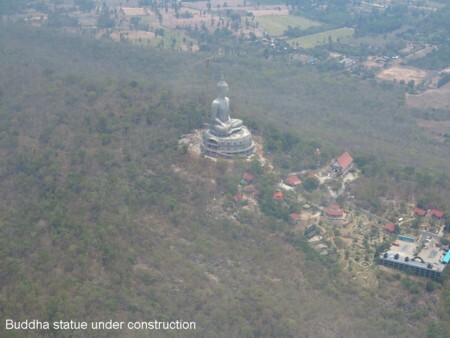 I've seen this temple (Wat) in a Tai Oratai video and so I wanted to spot it as we flew along the Mekong. 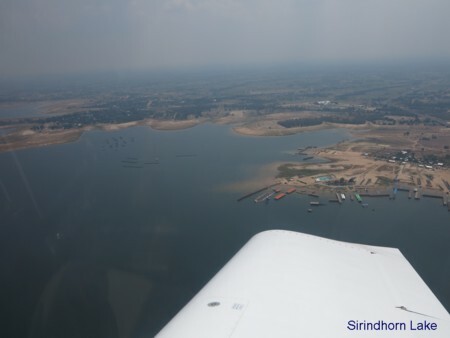 Today's flight plan was from Nakhon Phanom along the Mekong then down to Sirindhorn Lake before heading back to Ubon Ratchathani. 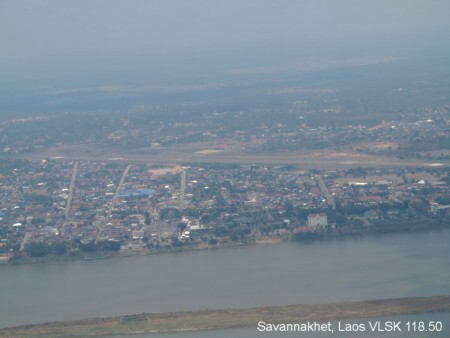 Along the first part of our route communication was with Sakhon Nakhon Approach on 123.35, but this was fading as I gave Savannakhet Airport in Laos a courtesy call as their runway is aligned for traffic to cross the river. We were handed off to Thai Military "Oscar" on 127.0 for the run down to Sirindhorn. Again we held on the downwind leg over the Mun River for traffic, and then we followed a 737 at a respectful distance to land. Took a taxi to the Sunee Grand Hotel where I had an embarrassingly big room with a spa bath etc. The bed wasn't so comfortable though. I met Aor's dad and went for a fish dinner. 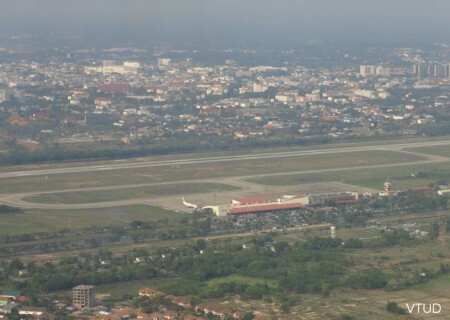 We landed at Nakhon Ratchasima at 12:25. 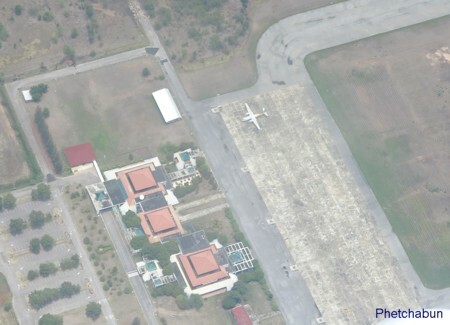 Bangkok Aviation Centre operate from Nakhon Ratchasima. 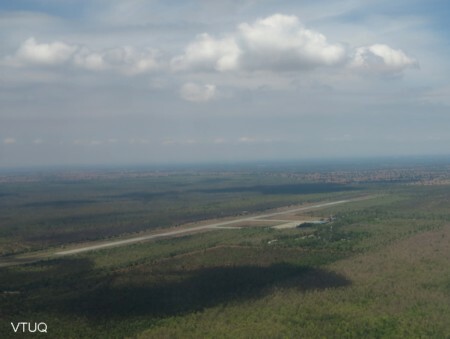 The airport is in the middle of a forest, and a long drive from the city. The taxi fare is 400 Baht. 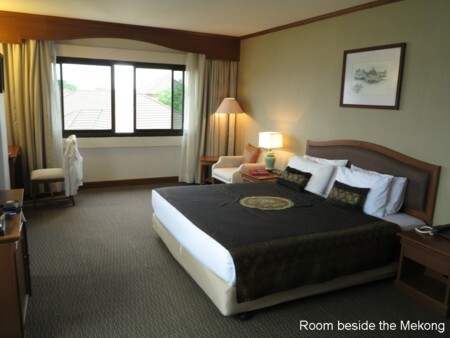 We stayed at a nice place, the Koranaree Courtyard Hotel. I was able to do my laundry across the street, 25 Baht including soap! 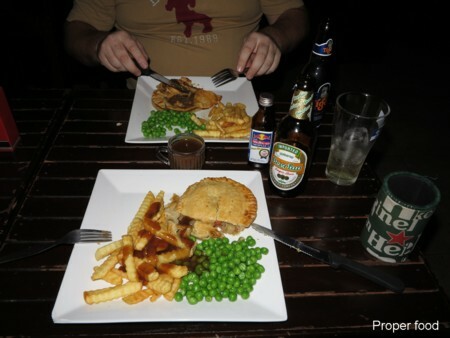 In the evening we went to a local farang bar to eat English food and play some pool. It rained heavily into the night. Staff at Thai airports all seem to be friendly and helpful. We had a few come out to see the aeroplane... In another situation I would take them flying, but not so easy to do here. Departure was at 11:05... Off 05 with a 12 knot tailwind... They can't accommodate into wind takeoffs. Then the Approach controller insisted that we must fly at 4,500 feet westbound. 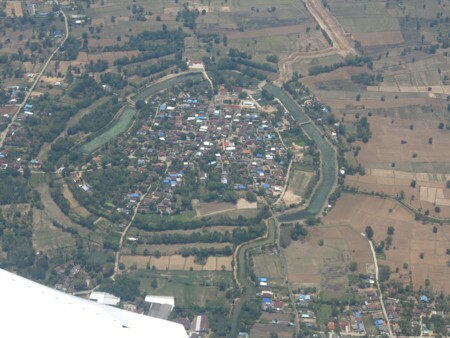 This is correct above 3,000 feet AGL. I requested 2,500 feet initially, and this was accepted for a while, and then he kept going on about it until I climbed to 4,500 feet. There is no regulation that says I have to fly a minimum 4,500 feet when the ground is less than 1,000 feet ASL, but it's not worth arguing even if you're correct. 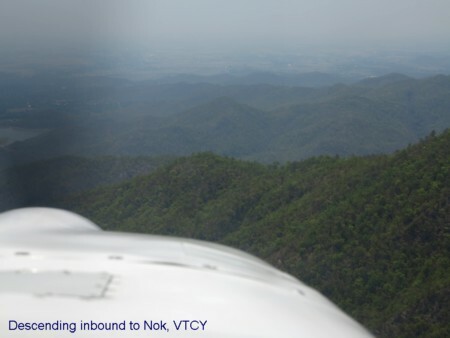 Following the rain the air was clear as we left Nakhon Ratchasima to climb to 4,500 feet for the northwest flight to Nok. Takeoff was two minutes late at 11:22. 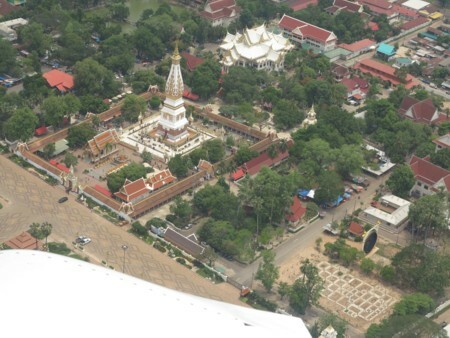 While there was heavy rain in Isaan, the Northwest of Thailand has not seen rain for months. It's very arid, and so the farmers have a lot of opportunity to create smoke to the detriment of their fellow human beings. 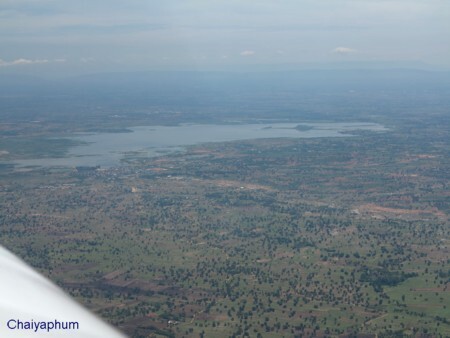 We landed at Nok at 13:45 after 2 hours 23 minutes in the air.